Have you ever wanted to make “pretty” labels for various items around your house? For example, containers in your kitchen, like flour or sugar? What about labels for storage boxes or baby bottles? I recently found that I could make labels for all of these items using packaging tape! In January, I saw several posts in different crafting Facebook groups about this method and was skeptical that it would work – but it does! In fact, I labelled several of Henry’s bottles back in January and after being washed hundreds of times, the labels look the same as the first day I applied them. To make packaging tape labels you will need 5 common household items: paper, packaging tape, scissors, a bowl of water, and a laser or toner based printer (Inkjet printers do not work!) These labels are really easy to make and super fun! If you prefer written instructions, they can be found below the video tutorial. To get access to the FREE kitchen printable used in this tutorial, subscribe to Super Savvy Sarah! If you are on a desktop, you can enter your email address in the box on the right hand side of this screen or if you are on a mobile device, in the box at the bottom of this post. *If you don’t have access to a laser or toner printer, I suggest you have your design printed somewhere, like Office Depot, your local library, your neighbor’s house, etc. These labels are totally worth the few cents a print out will cost you to print a page (or two)! To get started, make your design using whatever program you like. I prefer to use Microsoft Publisher or Microsoft Word, but any program (including Paint) will work. Take a piece of clear packaging tape and cover your design. To help apply the tape as smoothly as possible, I suggest starting at the bottom edge and slowly pushing the tape upwards. You want to be careful to avoid any wrinkles or air bubbles. Press the tape firmly onto the paper to make sure the ink will transfer to the tape. The quality of your image will be based on this step. You can use your hands or a popsicle stick. Cut the tape as close to the design as possible. Place the desired tape label into a bowl of warm water. Allow the tape label to soak for approximately 1 minute (or more). Remove the tape from the bowl of water and use your fingers to rub the paper backing from the packaging tape. You may have to dip the label back into the water to ensure you remove all the paper residue. Allow your tape label to dry for a few minutes and then adhere it to your desired surface. You can make colored labels if you have a color printer! You can apply the labels to all kinds of surfaces, like glass, plastic, books, etc. Higher quality packaging tape makes more durable labels! 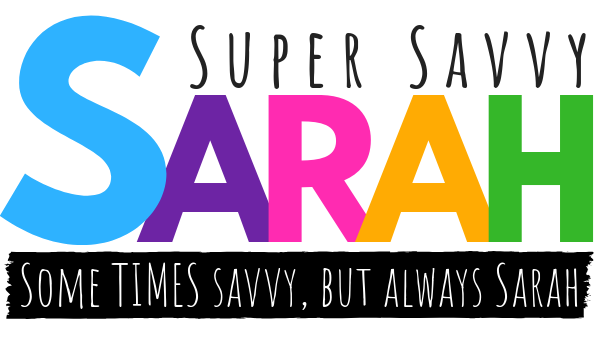 When you are done labeling things around your house, post a picture to the Super Savvy Sarah Facebook page! Let’s get inspired! It takes a village – join mine!